Beginning in the late 1980s, many of Thailand's elephants were decommissioned from laboring as timber haulers. So what's a retired pachyderm to do but play a little polo? 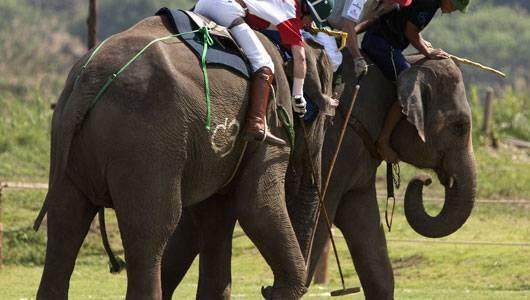 From March 23 to 29, the Anantara luxury resort in northern Thailand's Golden Triangle will host the annual King's Cup, a matchup in which elephants replace the more traditional horses. Ten teams fielding players from around a dozen countries will be competing trunk to trunk. For hotel guests who want to join the action, the Anantara and the neighboring Four Seasons Tented Camp will field show teams that will play each other without disturbing competitive play. The tournament's proceeds go to charity, and so far the Cup has raised $200,000 for the National Elephant Institute, which ministers to Thailand's 3,000-plus domesticated Elephas maximus. One year's money covered the construction of a custom-made pachyderm ambulance. The rest of the year, the Anantara and the Four Seasons, which are nestled in the lush forests near Thailand's border with Burma and Laos, collaborate on the Golden Triangle Asian Elephant Foundation. The sanctuary and hotel properties are home to around 30 elephants, all of which might otherwise be languishing as street beggars. Often, soliciting snacks from urbanites and tourists is the only way an owner can cover the cost of feeding an animal that in the wild eats up to 550 lb. (250 kg), or around 5% of its body weight, each day. (Foreigners may thrill at the sight of an elephant plodding past high-rises, but a smoggy metropolis is not a natural habitat for creatures unused to cars or open manholes.) Hotel guests who want to sponsor an elephant can volunteer about $1,000 a month for the animal's upkeep. The donation covers not only vet bills but also the salary of the beast's mahout, or elephant handler. And, of course, a never-ending supply of bananas. The London-based global authority on records said the move brought its policy into line with other records that are potentially harmful to animals. GUINNESS HISTORY: The records Guinness previously held relating to elephant polo were for the most wins in elephant polo world championships and for the world championships with the heaviest contestants. Guinness World Records said Monday it had decided to remove all references to elephant polo, following complaints from animal-rights campaigners. "Guinness World Records does not recognise any records relating to elephant polo," the group said in a statement. "The decision to rest these records was based on expert counsel which advised that the activities related to elephant polo could be potentially harmful to the animals. "This decision is in line with our policy not to accept or recognise any records based on the killing or harming of animals, this includes fox hunting and bull fighting." People for the Ethical Treatment of Animals, which has lobbied Guinness over the issue, said it had been informed of the move in a letter from Craig Glenday, the Guinness Book's editor-in-chief. A PETA spokeswoman told AFP that the decision "reflects the public consensus that the archaic use of live animals for human entertainment should remain in the pages of record book history." "Elephants used in polo are often beaten with sticks and gouged with heavy rods with sharp metal tips," she said. "Elephants exploited for polo matches are likely unweaned when they are taken from their mothers to be broken and made to fear repercussions if they do not behave as required. "They are subjected to a life of chronic physical ailments, social and emotional deprivation and premature death." 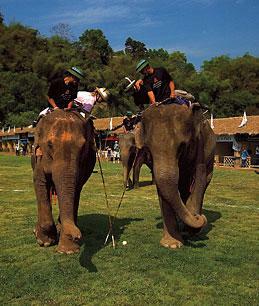 A form of polo played with elephants instead of horses is popular in India and Thailand. The records Guinness previously held relating to elephant polo were for the most wins in elephant polo world championships and for the world championships with the heaviest contestants. The records were dropped in October last year. They tried tiddlywinks first, without a great deal of success. next . . . equestrian events, showjumping, dressage etc. Do horses want to do all that silly stuff? what? has anyone asked the elephants?